Learning to effectively manage projects is an incredibly important skill, especially when working toward a whole new marketing strategy or even updating the existing plan. 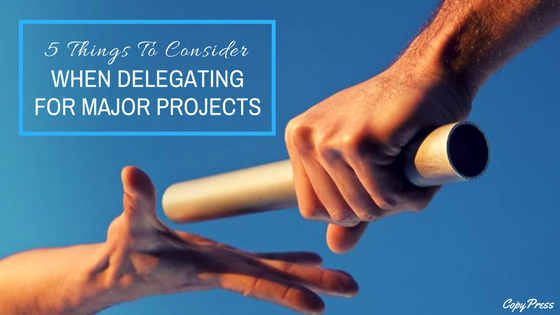 Whether you have a small team dedicated to one particular facet or you’re in charge of a large, multi-tiered project, delegating appropriately can help smooth out the project and keep you and your team members from feeling overwhelmed. Delegation can be tricky, however, especially if it’s something you’ve never done before or you’re working with a new team. That’s why we’ve created this guide to help you delegate with maximum efficiency. Learning your team is the first step toward successful delegation and therefore successful project completion. This is more than just names and small talk — take some time to learn each of their strengths and interests. If you have a team member that has no problem with tedious work, assign them spreadsheets and data input. If you have a member with a strong preference to work alone, give them a task that doesn’t require interaction with other members. By identifying the strengths of your team members, you’re also helping foster teamwork and cooperation as well as goodwill among the members. Assigning someone a task that they’re ill-equipped to handle can end up isolating them from the team and build resentment within the structure. This can lead to poor work or difficulty with communication. Of course, the time will come when you’ll have to give someone a task that they don’t want to do. This is the nature of project management. However, by giving them additional tasks that play into their strengths and being understanding if they come to you with problems, you can help ease them into this new role without shouldering the responsibility of those tasks yourself. It’s important to not let yourself be taken advantage of and not let your team members pass off responsibilities they just don’t like. Not every project is going to be fun and exciting, but they all need to be done. Being understanding yet firm can help cement your leadership. If there are specialty portions of the task that your team is not equipped to handle, it may be a good idea to look for outside help. For example, if you need specific copy content written or graphic design work and don’t have anyone with a strong creative background, it may be prudent to contract outside help instead of potentially having to redo portions of it over and over and slowing down your timeline. After you have everything delegated out, it’s time to set some clear priorities. Foundation work needs to get done first, followed by more specific tasks. For example, a website will need to be built and coded before you start putting in graphics or content. Identifying priorities before any tasks begin is a good way to establish a solid timeline and help avoid slow ups or changes in overall direction. In addition, identifying priorities will help you get a stronger overall grasp of what the project will entail. High-difficulty, detail-oriented tasks should probably stay with you, while less-difficult, broader tasks are easy to delegate out since they require less oversight. Speaking of oversight, this is often the most difficult part of managing projects: learning to let go. You’ll have to trust your team members to handle their parts of the projects. This feeds into knowing your team members well: If you know their strengths, you’re more likely to appropriately delegate tasks to them. Micromanaging is one of the fastest ways teams fall apart and projects get delayed. Asking for updates every few hours, insisting that everything be done exactly how you would do it, or harshly criticizing the work that your team has done and making them redo it are some surefire ways to make the project far more difficult than it should be. At the end of the day, as project manager, the responsibility of good execution falls on your shoulders. Trusting your team and allowing them to work without constant input from you can help ensure they’re more open to constructive criticism when the time comes and will create a supportive environment that often leads to better results. Just because you’re letting them work without you hovering over their shoulder doesn’t mean your team members need to work completely independently. Always be willing to teach if your help is needed — by helping your team learn valuable skills, you’re making future projects easier while also making the team stronger. Team members can help teach each other as well, and sharing skills leads to an overall stronger unit. After you’ve taught, offering continued support and reinstruction is important. It’s easy to lose patience when you have to reteach something, but by reaffirming their skills, you’re helping to build confidence and reducing the chance of errors. If this is a skill your whole team will need, it may also be helpful to teach one member thoroughly and have them instruct the rest. Teaching is one of the best ways to learn something efficiently. Whether they’re learning to use a new piece of software or adhering to a new style guide, a detailed understanding can be nothing but helpful. When delegating, your instructions must be as clear as possible. You’ll be working too, and being stopped regularly for project directions can slow you down and delay the overall assignment. If possible, creating style guides or instructions for every major part can help clarify the roles the team members have to play and what their tasks are. The clearer you are at the outset of the project, the easier time your team will have completing their individual tasks. Writing down detailed instructions may be too time-consuming, but oral instructions can work just as well, especially if you don’t mind repeating them a few times. If you have a team member that just can’t grasp what it is you want them to do, it may be time to redelegate. Instructing over and over again slows everything down, and the task you’ve assigned them may be outside of their abilities. Flexibility can be a useful trait, especially if you have a tight-knit team. These tips can help you delegate and make your delegations successful, whether you’re working with a brand-new team or the same group of professionals.